A good piece of literature makes us look at our friends and our ideals and question them. Just who we are and what we believe should be looked at by ourselves once in a while. And that is what Robert McGill has done through his protagonists in his novel Once We Had A Country. It is a stunning and complex book that boldly reflects the human condition. “Get your old man a beer?” he says. Without a word , she jumps down runs for the fridge. Today, as she received Communion, she was made to understand that something had changed forever. It seems this ritual will remain, though Maggie bringing him beer and changing the channel when he asks. Sometimes she would prefer a book, but her father never reads. He says books only tell you about the past; it’s TV that keeps you up to date. Side by side each evening he and Maggie sit before the set, eating their dinners from foil compartments on trays. When they visit Gran next door, she makes wry comments about scurvy and the Children’s aid, and then Maggie’s father buys apples or grapes that sit on the counter gathering dust until the house grows lousy with fruit flies. There are times when Maggie herself wishes for some kind of change in their routine – a friend to stay over, dinner at a restaurant – but her father appears content, though he has no hobbies and doesn’t travel, hardly leaves the Syracuse city limits. He never complains about clerking at the Public Works Department. It seems he wants nothing beyond the silent hours of Maggie’s company in the living room, and the worst way in which she could betray him would be to ask more herself. Sitting with him in his easy chair, she puts the veil back on and flips it side to side, watching the television grow clear and shrouded by turns. It wasn’t until her childhood was over that she realized she’d been desperate to get out. Her father must have sensed it sooner, the way he turned against her once she got to college. Then she spent half her money on long-distance calls from Boston, close to tears, trying to make him understand without saying it outright that he didn’t want the same things he did. Except now he’s in Laos, and what the hell does she know about what he wants? Maybe if she understood his desire she wouldn’t be so angry with him. The story starts in the summer of 1972. A group of young disillusioned people move from the political turbulent United States to start a cherry-orchard operation in Canada. But all is not ideal within the new commune. Friendships fray, ideals are questioned while the trees need attention. Maybe starting anew wasn’t such a good idea. Maggie thinks of telling Fletcher about her encounter with Wale in the playroom but decides he already has enough to manage. Each day seems to bring him into conflict with people on the farm. Those on the payroll begrudge the chores he assigns them, while those who aren’t being paid don’t bother with his labour schemes at all and entice the others to movie matinees in St. Catharines or the beach at Port Dalhousie. In bed he complains to her that Dimitri’s the main culprit, setting a bad example with his truant walks in search of (pet cat). Fletcher complains about the garbage everywhere, the mud on the floors, the noise from the record players and car stereos, the shouting and laughing downstairs that make it hard to sleep, until he and Maggie end up arguing over which of them should go tell people to be quiet. In the mornings, there are often bodies asleep in the hall, and many residents of the barracks don’t get up until noon. Fletcher starts going out to the building before breakfast, rapping on the doors and hollering hellos, poking people awake. His shortwave radio goes missing, then his welding torch. She tells him not to take it personally, but it’s no good. At meetings, he battles with Dimitri, who hasn’t lost interest in debating. While fletcher sits with pens and sheaves of notes laid out on the coffee table like weapons, Dimitri take equine strides around the room and sweeps the hair from his forehead. He wants a credit system to apportion the work more fairly. Fletcher wants to ban drugs and set a nightly curfew. The number of Fletcher’s supporters shrinks with each meeting, and half-jokingly Dimitri takes to calling him Captain Morgan. Brid, whose vote cannot be depended upon by either man, rolls her eyes a lot. It makes for compelling film but is hard on Fletcher’s nerves. He vents his anger watching TV coverage of the Republican convention. One night Maggie catches him before the bathroom mirror speaking to invisible assailants. While it is a complex story, Once We Had A Country by Robert McGill is a brilliant book. Not one to be taken lightly but should be critically thought through while read. 1) It has been a bit of time since Her Red Hair Rises with the Wings of Insects has been released. How are you finding the reaction to it so far? A: The book was launched last October and I’m pleased with the reactions from readers so far. It’s had several positive reviews, a Raymond Souster Poetry Award nomination and my reading of it won IFOA’s Poetry NOW competition. One writer, Lisa de Nikolits is currently tweeting lines from it on Twitter. It’s rewarding to see readers respond so favourably to the work. 2) I recently met a poet who lamented that many people are disappointed that her work “doesn’t rhyme.” Do you find that poetry has a stereotypical image that may be keeping readers away? A: Poetry demands a reader’s full attention. What you give to the poem the poem will give back. This requires concentrated effort and full engagement with the text. Not everyone is willing to surrender to the demands of poetry or even to seek it out. But if you do, you may feel as Emily Dickinson put it, “as if the top of my head were taken off” I know that happens to me when I read good poetry. 3) Who are your favourite writers? Who are you reading right now? A: I have too many favourites to list them all. My taste in poetry is quite varied with a slant towards Irish, Northern Irish, and UK poets, given I studied poetry in Northern Ireland (completing an M.A.) and lived there for many years afterwards. In addition to reading Mary Ruefle’s collected lectures Madness, Rack and Honey and James Longenbach’s The Virtues of Poetry, I’m re-reading Louise Glück, Seamus Heaney, Tomas Tranströmer and Wallace Stevens. Next week this list will change. 4) Why do you use poetry to write? Have you ever tried any other forms of writing to express yourself? A: I find poetry uses me. With this in mind there is no why. I love what poetry can do: say the most with the least amount of words. I have written some prose, but poetry is my first love. I couldn’t live without it. 5) There are a lot of people who seem to be writing poetry right nowjust for their own personal enjoyment. Do you have any advice for people who are doing that task right now? A: The best advice I can give is to read poetry and never stop reading poetry. 6) Your website lists you as “Marketing Coordinator” for the Rowers Reading Series. Does that job help you with your writing at all? A: Volunteer work such as being the marketing coordinator for the Rowers Reading Series is a way of giving back to the writing community. Showcasing talented writers on a monthly basis helps connect writers with readers. Hearing authors read their work aloud can add new dimensions to the text through the power of the listening experience. It doesn’t help directly with my writing but it is extremely rewarding watching invited authors shine on stage. 7) You seem active on the social media platforms like Twitter. Do you find such tools useful in helping with your writing? A: I’ve only recently joined Twitter so I’m still learning the ropes. Social media doesn’t help me directly with my writing but it keeps me informed with what’s going on in the literary community. It also helps me connect with other writers. I can be found here: @catgrahampoet. 8) Have you done any public readings? If yes, what was that experience like for you? I’m always nervous before readings but once on stage I try to let the words do the work. 9) Are you working on anything new right now for publication? A: I’m working on new poems at the moment. If past history is any indication, they will eventually show me when I have a new manuscript. Anthony De Sa has written two brilliant novels. Barnacle Love (Link to my review) and Kicking the Sky (Link to my review) have great descriptions to small details. And that is the beauty of De Sa himself. After reviewing those books, friends make comments like “My wife played Scrabble with him at a charity event” or “I took a tour of a Toronto neighbourhood with him” and his easy, simple nature is often noted. Last week at pub night, I forego my usual craft-beer order and went with a bottle of Molson Export. My bartender noted my change and I mention that I wanted to contemplate the logo of the sailing ship, like a immigrant-character did in one of De Sa’s book. The bartender looked at me and said he had often heard that immigrants and visitors remarked about their journeys to Canada while looking at that logo. De Sa recently took time out while on a trip to Tanzania to answer a few questions for me. 1) It has been a little while since Kicking the Sky has been released. How has the reaction been to it so far? A: The reaction has been very positive. Critically, the novel received positive reviews, but it’s the response by readers that has been so rewarding to me as a writer. 2) Toronto has been an important setting for your books and stories. How do you like living there right now? Does it’s cultural scene provide you much inspiration for your writing? A: Toronto is my home. My travels in the U.S.A to promote my American release of Kicking the Sky was a terrific experience, but it’s always good to come home. The cultural scene in the city is vibrant, but it is the neighbourhoods and the people in those neighbourhoods, that inspire me. Many have come from very far to make Toronto and Canada their home. This was certainly a big part of writing my first 2 books. A: Faulkner, Richler. I’m a big fan of Michael Crummey. It’s quite the variety. I was in the Dar Es Salaam airport a couple of days ago and picked up a copy of The White Masai by Corinne Hofmann. This book (I had never heard of it before) is a white European woman’s account of falling in love with a Masai in Kenya. She decides to marry him and this is her story. It is romantic, but it’s also a real piece of social anthropology. 4) Has your writing changed since you were first published? If yes, how so? A: I don’t think it’s changed. My style has remained the same. But my editor might disagree. 5) You seem to be active on several of the social-media platforms right now (Twitter, Facebook) Does being there help your writing at all or is it more of a means to keep in touch with fans of your writing? A: Social media has become an important part of marketing a book. That being said, for me, the most rewarding part of it is the play between industry people, readers, other writers and myself. It doesn’t help the writing. In fact, it could easily detract from the writing process because the sheer amount of time spent on websites, Facebook, Twitter, and blog contributions, takes me away from research and writing of my new book. 6) Do you do a lot of travelling? (I know you mentioned on FB that you are about to embark on a trip to Tanzania.) If yes, does travelling help your writing at all? A: I’m currently answering these questions in my hotel room in Zanzibar. There are few perks in becoming a writer. I know it doesn’t seem that way to most people who are striving to get published, but it’s true. One of the best parts of being a writer is meeting with people who have read your books and travelling to places you never thought possible. It really is wonderful. Fans of Rick Blechta know how he mixes his knowledge of music into his work. His thrillers give the sense of being well-researched and well-thought out. This year will be a very busy one for Blechta as he has just released The Boom Room (Link to my review) for the Rapid Reads program at Orca Books and Roses for a Diva for Dundurn Press in November. 1) So it has been about a month since the The Boom Room came out. Was it difficult to write for the Rapid Reads series? How has the reaction to it been so far? A: Writing is writing, but that being said, every kind of writing needs a different “toolbox”. Marching orders from Orca for my Rapid Reads books are pretty specific, and most of it has to do with the fact they’re primarily written for those without great literacy skills. But the final one is always that “the book must be a good story, well told.” Okay… I’ve managed to write two of them now (with a third hopefully coming next year or so), and I’ve found that once you wrap your head around the “simplicity” aspect of Rapid Reads, they’re not that much different than other books. The same care has to be taken with the plot structure. Because they can’t be more than 20,000 words, you can’t have much in the way of characterization or subplots, but telling the story well is not that hard within the given framework. As for the reaction to The Boom Room, it’s received two reviews (that I’m aware of) and both have been very positive. Since one was in Library Journal, we’re hoping that this will help with sales throughout North America. There are a lot of libraries out there! 2) Who are some other writers that you admire? What are you currently reading right now? A: For current crime writing, I enjoy Michael Connelly, Denise Mina, Peter Robinson and Barbara Fradkin. If you want to go back to books from the past, I really enjoyed all the Nero Wolfe novels and Maigret novels, Further afield are authors like Tolkien, Robert Louis Stevenson, and I got my start reading crime fiction with the Hardy Boys. And then there is Sherlock Holmes. As a child, those were my favourites. As for right now, I just finished Barbara Fradkin’s The Whisper of Legends (excellent) and I’m about to dive into Vicki Delany’s latest. 3) Like many other writers that I have followed, you have had a series of occupations and interests. Did being involved in those activities help you at all in your writing? A Case of You seemed to have a lot of background on the Toronto music scene for example. A: Up to this point, all of my novels and novellas have involved some sort of musical background, whether it’s the main character being a musician or the backdrop being the music business. A Case of You is not that only one that is set in the Toronto music scene. The way I look at it, everything you learn and experience as you make your way through life can become grist for the writing mill. I’ve been a musician for more years than I care to acknowledge so why not use that? Readers find it interesting, I can write about it authoritatively, and it brings something a bit out of the ordinary to the plots of my novels. Plus, since I know all this stuff other people don’t, I can spend more time researching other things for my novels. 4) Your website says you have another book coming out in the fall called Roses for a Diva Could you provide a brief synopsis? A: Roses for a Diva is a good case in point. It’s about an opera singer who picks up a rather over-the-top fan. At first she’s enchanted. At the premiere of every new production, she’s been receiving beautiful bouquets of roses. Then other things start happening in her life, things that are decidedly not nice. Is she imagining it or is it her fan who’s responsible — and does this person have other intentions? So, here I’m again using a musical background to give my story a bit of something out-of-the-ordinary. 5) How do you like living in Toronto? Does it cultural scene provide you inspiration for your writing? A: I enjoy living in Toronto (as long as our infamous mayor is deep-sixed in the election this fall), but I don’t think its cultural scene has provided all that much inspiration for my writing. Actually, I like getting my stories out of Toronto as much as possible, if only because it means I’ll have to go someplace new in order to research my novel. Roses for a Diva has sections set in Rome and Venice, so naturally I was forced(!) to visit both cities (for several days each) so that I could do research and also get a feel for what I would be writing about. It’s those small details gleaned from actually having been to a place that make it seem real to readers. There are several things I included which I wouldn’t have known about had I not actually walked the streets in these two iconic cities. I do the same thing for my Toronto settings, of course, but it’s a little different to hop on a subway and scout some location in Toronto, compared to spending a week in Rome. 6) You seem active on the social media fronts (ie Facebook) Does it help with your writing or does it distract you? A: I try to pay attention to Facebook, but not let it rule my life. I have friends who spend hours a day looking at Facebook posts. For me it is simply a tool to let people know what I’m up to, both in writing and in music. Yes, it also does help me keep in touch with friends, but to me it’s more of a promotional tool than anything. 7) Has your writing changed since your first book? If yes, in what ways? A: I would hope that my writing has gotten at least marginally better. Like anything else, writing needs to be practised, and practised consistently. A writer needs to leave no stone unturned in an effort to improve. This usually comes from reading (and talking to) other writers, seeing how they’re doing things, and then trying to bring those good ideas you’ve gleaned to your own work. Writing will also improve by listening to what people are saying about your work. A lot of criticism is disposable, but when I hear the same thing from a few sources (especially reliable ones), I know I have a problem that needs to be looked at seriously. The angle I’m always looking at improving is saying more with less. Words can have great impact when used properly. I still get really excited by making a sentence better by making it shorter. 8)There are a lot of people who seem to be writing fiction right now just for their own personal enjoyment. Do you have any advice for people who are doing that task right now? A: I write because I enjoy writing. That’s the same reason I still make music after all these years. If you’re writing for personal enjoyment, that’s great. But the step from there to an actual career in writing is a very large one. I explain it this way. Having books published is actually an amalgamation of two jobs: writing and “authoring”. Being an author is the business part of being a writer. It requires a completely different outlook and skill set. It’s more of a job in sales than anything creative. Fortunately, it’s something that can be learned (and taught — although it’s generally not), but you have to be willing to take that part of the equation seriously. There are very few of us ink-stained wretches who have the world beating a path to our doorsteps. We have to get our wares into the public eye by pushing hard, promoting what we do at every opportunity. Writing a book is the easy part. Getting it published and promoted properly is a lot more difficult, and unless you like that sort of thing, it is certainly not as enjoyable. But if you’re going to experience any kind of success, you have to learn to be just as good at that aspect of your craft as you are with putting words and ideas together. For anyone aspiring to get their fiction published, I say this: learn your craft, both parts of it, the fun and the not-so-fun aspects, then decide if you actually want to make this your career. 1. It has been a while since The Ghost Brush/The Print Maker’s Daughter has been published. How has it been received so far? A: How many languages has it been translated into at this point? Let’s see… French, Spanish, Romanian, Latvian, and Japanese. I am most excited about the Japanese version, which comes out in June. I’m going to Japan to face the music. (smile) Hokusai is an icon and the role his daughter played in his work has not been well known, or well accepted there. Although I think Oei’s time has come. I had that on the signature of my email for a while. Always made me happy. I wish I could say the sales were equally thrilling. But I hope the book will last. It is getting in to places like gallery book clubs and art history curricula. The interest in Edo period Japan has carried it a long way. 2. Am I correct that “Half for You, Half for Me” is a bit of a departure from your usual writing? Could you provide a bit of a background on that book? 3. Who are your favourite writers? What are you reading right now? A: I just finished AMERICANAH by Chimamanda Adiche. I enjoyed that, because of my interest in immigrants and their experience. Before that THE PURCHASE by Linda Spalding, STET by Diana Athill, went through a phase of Steven Heighton, Jim Craiche, Jim Harrison. I read for story, and forstyle. I read just about everything, but I give up quickly if I don’t like what I’m finding. Favourite writers? That’s hard, I have so many. My favourite novel of all time is MIDDLEMARCH. 4. How much of your writing is based on personal experience? Do you include other people’s personal stories in your novels or do you rely on your imagination to come up with some of the situations in your books? A: When I started writing fiction, it was very personal—not only the novels but especially the short stories. But as the years went by—I first published thirty-five years ago, in 1979– I began to reach farther. Partly it was for the challenge of going into unknown territory, bigger worlds, a bigger canvas. Partly it was because the urgent need to sort myself out and understand my nearest and dearest through fiction went underground. It creates certain difficulties, as you might imagine. I still deal with issues that are central to my being, but I may set a story in nineteenth century Labrador or Japan, which creates a useful disguise. Also, indirection is fruitful, I find. It is nicer now to come upon the heartbeat of my writing by surprise. 5. Are you working on any new novels right now? A: Right now I am doing a big edit on a new novel that will come out about a year from now. It’s set in the Rocky Mountains, over about the past century. It has been fun to write- what a change from writing about Japan! I actually can read the language. The mountain parks in this country are a kind of black hole of human history. There is just wonderful material there and it’s very close to home for me. 6. Has your writing changed much since your first novel? If yes, how so? A: It has changed in that I have become more ambitious and at the same time, probably less intense and intimate. I look back at early stories, for instance, and am struck by their candor. We develop protective layers throughout life, and – form, anyway- these show up in writing. I am waiting for the big moment that you read about when suddenly you are old enough to not give a fig what you say or who is bothered by it. Longevity is my family’s middle name, which is a joyful thing. What it means, however, is that part of me is still a daughter. I think the world will look very different when the older generation has gone off stage. 7. You seem to spend a lot of time traveling. (I know your Facebook profile seems to mention Toronto, Alberta and Arizona as places you have “hung your hat” recently) Does traveling help you with your writing at all? A: I do go back and forth between Toronto where my husband and kids are, and Canmore, Alberta, where I have a vacation house and can be near my parents and sisters. Arizona was a one week holiday, and I loved it. But I have done a lot of traveling in the past, and wrote travel articles, did research in many countries, and sat scribbling in foreign hotels. I’ve always found that from the moment I sit down on a plane I can empty my mind of the many details and responsibilities that clutter it, at home. I step into a strange city all alert and sponge-like, ready to feel and absorb and collect. Unfortunately travel has become more exhausting and less rewarding in the last decade or so. Is it just me? It’s harder and harder to get that feeling of foreignness, to be really “away from home”. At the same time the trip itself has become more of an ordeal. Nonetheless I’ll keep doing it; it’s a bit of an addiction. 8. There are a lot of people who seem to be writing fiction right now just for their own personal enjoyment. Do you have any advice for people who are doing that task right now? A: Yes, I have noticed that. More power to them. I think it is a great way to discover yourself and to appreciate the world. But the question of audience is really vexing. Speaking of Facebook, I was rebuked recently when I referred to Vivian Maier’s work as “unfulfilled”. She is the woman who lived as a nanny, took millions of photographs, and showed no one her work. People thought I meant she was unfulfilled. Well, I don’t know if she herself was or wasn’t. What I meant was that the art was unfulfilled, in the sense that it seemed to beg an audience and never found one. I am not sure if I could write “just for personal enjoyment”; to me there is always a lurking idea of the readers to come. But perhaps if I were starting out today I would feel differently; probably I would. Those readers are increasingly hard to find! I came across Kathleen Winter’s “Annabel” during a low point in my life. I had entered the field of media believing that it was a way of documenting the human condition but most of the jobs I held in that field were nothing more than glorified advertising positions. Winter’s “Annabel” documented an important discussion of human desires trapped inside all of us. And opened up a conversation on several fronts that I was party too. It was an honor to have Kathleen Winter partake in a Q&A for my blog. 1) I am curious about the reaction to Annabel has been in general. I have attended a few discussions about the book in different cities and there always seems to be some unease by a few people on the general discussion of gender roles and sexuality. Have you encountered anything like that? A: I like the fact that the book causes people to think about many aspects of life, including gender and sexuality, in a way that sometimes feels difficult. The story deals often with loneliness and isolation, and it’s also about what happens when courageous people can accept ambiguity and unease. I’ve had many reactions to the book and its subject matter, from people whose experience of gender and sexuality covers a large spectrum. Some feel unease, others feel release and joy. 2) Did you base any elements of Annabel on any anecdotes from family or friends? Or is it a work based on research? A: This book is, like other work of mine, a combination of material I have experienced, overheard, researched or imagined. What I am aiming for is emotional truth told through realistic detail, with fantastical elements that allow the story to open up and glitter. 3) How was the Canada Reads experience for you? A: It feels unnatural for me to take part in competition, especially in the arts, and while I appreciate that the book reaches new readers through the CBC program, I’m probably like many artists when I question the extreme conflict mentality behind the process. I love all the writers and all the books and do not like to see one book rise above the others at the expense or insult of authors and their hard work and imagination. But I think the CBC and listeners understand this on some level, and that everyone is trying to honour all the work. A: I’m in the copy-editing stages with a non fiction northern journey memoir called Boundless, to be published by (House of) Anansi in Canada and Jonathan Cape in the UK/Australia/NZ – German rights have also been sold. I’ve been working with editor John Metcalf at Biblioasis on a new story collection titled The Freedom in American Songs. Both books are to come out in September 2014. 5) Who are some of your favourite writers? What are you reading right now? A: I love the American writer Gretel Ehrlich and her crystalline writing about her northern circumpolar travels. I’m reading Peter Matthiessen’s The Snow Leopard right now, and Diana Athill’s memoir Towards the End. I love the letters of Katherine Mansfield and I read a lot of non fiction and poetry about how the natural world intersects with human imagination and spirit. Current fiction writers I love include my brother Michael Winter and my friend Alice Zorn. 6) Your brother Michael Winter is a talented writer as well. Was reading and writing encouraged in your household growing up? Is there any sibling rivalry between the two of you in terms of your writing? A: My father taught us to read before we went to school, and there was poetry in the house from that time on. We were taken to the library as soon as we could string the word c-a-t together and I remember sitting all summer long on the front step reading library books. I still love the crinkle of plastic library book covers and the “thunk!” of the rubber ink pad stamping the return date. Michael and I have always egged each other on and I think he is one of the most vivid and experimental and exciting writers on the go right now. 7) How do you like living in Montreal? Does its vibrant cultural scene help you with your artistic endeavors? A: I adore Montreal. I love the river, the balconies, the shops full of persimmons and almonds and unidentifiable delicacies, and the neighbourhoods where you can hear French from pockets of its own variance originating all over the globe. 8) You seem to have a presence on some of the social media platforms like Facebook. Does being on those platforms help you with your writing? A: I get bits of news and friendly exchanges with other writers that would be hard to come by if I were squirreled away without the web, but of course one has to nip certain things in the bud. 9) You seem to do a bit of traveling. Does that help you with your writing at all? A: Yes, it always helps to gain perspective through a change of scene, and I always observe and make sketches and take notes wherever I go,for future stories. 10) There are a lot of people who seem to be writing fiction right now just for their own personal enjoyment. Do you have any advice for people who are doing that task right now? A: I have no idea what that means. The first draft is a kind of personal enjoyment, but all the drafts after it are torture. 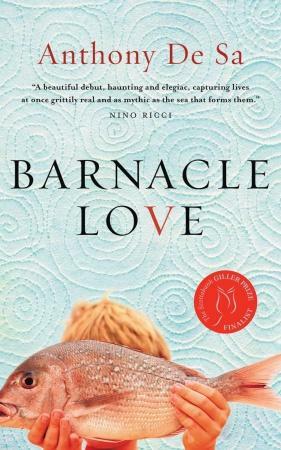 After reading Anthony De Sa’s “Kicking The Sky” (Link to the Review) I decided to read his first novel “Barnacle Love.” This book shows a bit more of the family history of the Rebelo clan as they try to make their way through life in Canada in the 20th Century. De Sa has documented many of the angst that many of us feel who grew up in an ethnic setting in North America. The Portuguese call it saudade: a longing for something so indefinite as to be indefinable. Love affairs, miseries of life, the way things were, people already dead, those who left and the ocean that tossed them on the shores of a different land – all things born of the soul that can only be felt. Manuel Antonio Rebelo was a product of this passion. He grew up with the tales of his father, a man who held two things most sacred. God and cod – bacalhau – and not always in that order. His father’s words formed vivid pictures of grizzled brave fishermen and whale hunters who left their families for months to fish the great waters off Terra Nova, the new land. Visions of mothers shrouded in black, of confused wives – the pregnant ones feeling alone, the others glad for the respite from pregnancy – spun in his mind. And then there were the scoured children, waving in their Sunday finery. The small boys bound in worn but neatly pressed blazers and creased shorts. The little girls scattered like popcorn in their outgrown Communion dresses as they watched their fathers’ ascents onto magnificent ships. In his dreams Manuel saw the men with their torn and calloused hands, faces worn, dark and toughened by the salted mist. As a child he would sit by the cliffs for hours, dangling his bare feet over the side of the hundred-foot drop to the shore, kicking the rock with his pink heels, placing his hands over his eyes to shield the sunlight, already yearning for the fading figures of the White Fleet. “One day I’ll disappear,” he’d say aloud. De Sa has a great sense in the use of words but it is also refreshing to read his take on the coming-of-age novel. The ethnic households of which many of us grew up in were not always floral costumes and flowing foreign languages. There were strife and conflicts in those households as the 20th Century drew to the close as old-world ideals clashed with life in North America. Manuel passed by his brother Jose, who sat at the kitchen dinette drinking a beer. Manuel moved to sink and smiled as he helped Antonio to sit atop the counter. Manuel knew his son – the boy he named after the father he himself barely knew – would need his guidance to grow into a proper man, the kind of man that would thrive in this land he had made his home. Manuel raised a bottle of Molson’s Export Ale to his lips. The blue ship with all those sails on the label always reminded him of the place his family came from, of the Portuguese with their proud tradition of shipbuilding and exploration. “Jose, what exactly-” Manuel stopped, not because he didn’t know what to ask but because he was afraid the question would lead him to a place he was quite content to leave alone. “What happened to Candida? You were there, you saw it.” “Estupida. She was so stupid, that girl, sometimes,” Jose said. Jose recounted the story, how Candida had found a red lipstick under a church pew, how she always had ideas of being a movie star, the kind that filled the smoky screens, always doing her hair in crimped waves when their mother just wanted her to get the house in order, to wash the dishes or sweep. “It happened shortly after you left; soon after we thought you were . . . dead, at sea. Mae was distraught and . . .” Manuel looked over at his six-year-old son to see if the words his brother had spoken had entered the boy’s head. He thought for an instant that it might be best to ask his son to leave, but chose not to. It was important to know things; knowledge was a kind of protection. Parents had an obligation to teach, he thought. Antonio just sat on the counter, prodding the dead fish in the sink with a straw. De Sa also has documented something typically Canadian in these stories here. Not something full with blustering patriotism but something honest and gritty at times. These are stories about growing up that tell what growing up was truly like. 11:14 A.M. A canvassing politician arrived just before lunch. “Hello, Mr . . .” – he looked at his clipboard – ‘”Rebelo? You’re a fine Canadian to honour your country this way.” “Yes, I Canadian.” “Well, the arrogance of this government,” He shook his head for effect. “This prime minister is destroying – ” “Who?” “Mr. Trudeau is destroying the very fabric of -” “Out!” my father hollered. He shouted it again, louder so that he could be heard over the anthem. “Out! Get-out-a-here!” My father strained his neck and gestured a kick, the same way he was taught to kick a football – with the inside of his foot, toes pointing outward. “I don’t understand – ” the politician squirmed. “I come from Portugal twenty-three-ago-years.” His thick accent was made thicker by his drunken slur. “I come to Canada with no cash-money-my feet is my shoes! My hands, they hard!” He pounded his chest; I heard the muffled hollowness. “Trudeau is the man. He promise to make things easy for bring my family over here. He keep his promise. The ever-smiling politician slowly made his way out, closing the gate behind him. Anthony De Sa has written a brilliant coming-of-age novel with Barnacle Love. He documents well the concept of growing up in an ethnic household in the 1970s and is definitely a writer worth following. Sitting patiently on the shelf waiting for me to read and review has been a copy of Siri Hustvedt’s The Sorrows of an American. I had been hearing about this book for a while and when I picked it up, I found myself engrossed by it. It has a definite non-linear plot and can be a bit of a challenge to read. But doing so it enlightened my reader’s mind somewhat. Now can I talk about a non-linear plot effectively here in my simple blog? My sister called it “the year of secrets,” but when I look back on it now, I’ve come to understand that it was a time not of what was there, but of what wasn’t. A patient of mine once said, “There are ghosts walking around inside me, but they don’t always talk. Sometimes they have nothing to say.” Sarah squinted or kept her eyes closed most of the time because she was afraid of the light would blind her. I think we all have ghosts inside us, and it’s better when they speak when they don’t. After my father died, I couldn’t talk to him in person anymore, but I didn’t stop seeing him in my dreams or stop hearing his words. Any yet it was what my father hadn’t said that took over my life for a while – what he hadn’t told us. It turned out that he wasn’t the only person who had kept secrets. On January sixth, four days after his funereal, Inga and I came across the letter in his study. So what happens when our healers are hurt themselves? What happens when the people whom we turn for answers have their own questions that need responses? There is a malaise that Hustvedt has tapped into here with this story about analyst Erik Davidsen. He and his sister are clearing out their father’s papers and they find a note which implicates their father in a mysterious death. While trying to discover the meaning of the note, Davidsen must also deal not only with his thoughts and desires, but with the complex and in many cases disturbing situations of the people around him. The complexities sometimes overwhelm him. There is no clear border between remembering and imagining. When I listen to a patient, I am not reconstructing the “facts” of a case history but listening for patterns, strains of feeling, and associations that may move us out of painful repetitions and into an articulated understanding. As Inga said, we make our narratives, and those created stories can’t be separated from the culture in which we live. there are times, however, when fantasy, delusion or outright lies parade as autobiography, and it’s necessary to make some nominal distinction between fact and fiction. Doubt is an uncomfortable feeling that can quickly become suspicion, and under the intimate circumstances of psychotherapy, it may be nothing short of dangerous. I began to feel this uncertainty with Ms. L in April, and I recognize now that it marked a turn not only in her, but in me. For almost six months, the pretty, well-dressed Ms. L. had sat tensely in her chair, knees locked together, eyes lowered as she revealed a life of privilege, money, and neglect: her parents’ divorce when she was two, her mother’s serial boyfriends, her mother’s long trips with them to houses and apartments in Aspen, Paris, the south of France, her mother’s breakups, bouts of weeping, drinking, and shopping. Ms. L.’s serial nurses and nannies, her father’s detested second wife and two children, his infrequent calls and sporadic gift-giving, the two hated boarding schools, her suicide attempts, her hospitalizations, her three weeks at a repugnant college, her abandoned lovers, both men and women, all repellent human beings, her abandoned therapists, all incompetent, the classes she started and then quit do the professors’ stupidity, her lost friends, her lost jobs, her periods of blankness and feelings of unreality, her grandiose daydreaming, her rages. The people in Ms. L.’s life fell into two camps only: angels and devils, and the former could quickly be transformed into the latter. “I came to you,” she had said early on, “because I heard you’re the best. ” I had said that words like best and worst aren’t applicable to psychotherapy, that it is work done together, but Ms. L. wanted a genius, a divine mother/father/doctor/friend. When I pointed this out to her, she smiled and said sweetly, “I think you can help me, that’s all.” Her idealization of me didn’t last. She began to ricochet from one extreme to the other, as I bounced from hero to villain, I felt increasingly fragile and hurt. It was difficult to keep my balance, but worse, she sometimes had a hard time separating the two of us, and her confusion began to cause me acute discomfort. Hustvedt has done an interesting piece of literature here. She has captured the spirit of malaise in the post- 9/11 and post-immigrant experience of North America we all feel today. Not a simple read for sure but certainly one that should be read over and over again. That night, I woke with a fever and the dim sensation that I had been working to pry open a huge metal box with my fingernails, a troubling dream-remnant that infected the unfamiliar, darkened room. A couple of seconds lapsed before I understood where I was. Then I hauled my aching body to the bathroom, downed a couple of Tylenol, and gulped lukewarm water from the tap. For a while I shivered in the too-short bed, and then, somewhere between full wakefulness and sleep, I listened to my own internal voice as if it didn’t quite belong to me anymore and watched the metamorphosis of colors and forms in that strange theater behind closed eyelids. The hallucinatory content of the next hour was probably caused by a combination of the virus or infection inside me and the fact that I had been rereading parts of my father’s memoir before going to bed. I dozed, then woke, then, nearly asleep again, I saw an amputee clomping down a long corridor on his stumps. the image forced me awake and I sat up in bed, my heart beating, the dwarfed figure burning in my mind. As my fear subsided, I understood that I had seen some half-conscious version of my grandfather’s brother, David, the family’s oldest son, born after Ingeborg, the dead baby girl my grandfather said had been buried in a cigar box. The Sorrows of An American by Siri Hustvedt is a complex book but one that brilliantly describes the uneasiness that many of us feel this days. Not a book that needs to be rushed through being read but one that should be reread and pondered over and over again. A few weeks ago I received a copy of Rick Blechta’s The Boom Room from Orca Books Rapid Reads series. (Link to Review) It was my first introduction to the series which has simple plots and easy language. The concept intrigued me so I decided to learn more about the program. Noted book publisher Ruth Linka took the time to answer a few questions for me. 1) The Rapid Reads website states: In our increasingly fast-paced world we believe there is a need for well-written, well-told books that can be read in one sitting. Could you expand on that a bit? Explain why you see a ‘need’ for this type of book. A: I think there is a bit of a trend to short fiction, with a few things having played a role, or answering this need: Byliner, the CBC prize for short stories, and Little Fiction magazine are just a few examples. And, then of course we’ve seen Lynn Coady’s short story collection win the Giller and Alice Munro win the Nobel Prize. Perhaps there’s a renaissance in short fiction? I hope so. But beyond that are people habits. Reading on our phones, our electronic devices, on the subway, in the coffee line up, in between the many things we do. Long fiction is still going strong (i.e. Luminaries) but in some ways it competes for our attention and I wonder if people read different types of materials depending on how much time they have, what device (including the printed book!) they are using and how much attention they can give it. All of this is part of the thinking for Rapid Reads, which aims to have excellent writing, great stories, well-known authors, all the things we value in longer fiction, but in a shorter, more accessible form. 2) How many authors are now involved with the Rapid Reads series in total? How do writers like writing for the series? Is it easy or hard for them to keep the simple format? A: We have just over 20 authors in print, and a number of new ones coming up including Linda L. Richards, Brian Harvey and Gail Anderson-Dargatz. The writers seem to like the write for the series, sometimes using it to explore an idea or a plot that wouldn’t work in a longer novel. Some of the authors find it easier than others. I think it’s a great exercise in any event, forcing the writer to keep their word count down to around 20,000 and still create characters with depth and a story that is compelling. 3) How has the series been received so far? How many years has it been in existence? A: The series was launched in 2010 and so far there response has been very positive, both to individual titles and to the series concepts as well. 4) There are reading guides for each of the novels written. What exactly is included in each of the guides? A: The reading guide gives some practical information, such as the reading level, a summary, and discussion questions. It’s targeted mainly at educators who use this kind of thing to prompt discussion or provide ideas for assignments. Orca does reading guides for all of our books so the option is there for the books to be used in a classroom or a library. For Rapid Reads the educators might be working with people where English is not their first language, or where there are some literacy challenges. 5) It has been my experience when trying to help people who have purchased e-readers that find they get easily confused by technology involved and end up going back to printed books. Are you planning to keep the series in printed form or are you planning to do e-reader versions? A: We do both. We have no plans to discontinue the print edition but we release the ebook at the same time as the print edition letting the reader chose whatever format suits them. 6) The website talks about books being written between a “2.0 and 4.5 reading level.” Could you explain what exactly that means? A: The reading level is calculated based on the average number of sentences and syllables per hundred words. These averages are plotted onto a graph: the intersection of the average number of sentences and the average number of syllables determines the reading level. 7) Will you be using social media at all for readers to interact with you? What formats will you be using? I saw the Pinterest page just now and I was wondering if you plan to use that more often now. A: We use social media a bit already, it has been part of my goal since arriving at Orca to do more on this front. I think Twitter will offer some opportunities to connect with readers, authors and educators. We will also continue to use Facebook and Pinterest. We also consistently do Goodreads giveaways and encourage our authors to be there. And, other places like 49th Shelf. Many of the authors have their own website and blogs. And, beyond that, we’re planning an update to the Rapid Reads website. 8) The website states that there is an interest with adults who are looking for a quick read. Is there a market for that type of reader? A: I think so. Both in terms of what I said above about reading in different situations where we can’t always access a long novel. 9) Have the authors done any public readings or participated in any book club readings? If so, what was the experience like for them? A: Yes, there have been some events for the authors. The response has been positive – often the authors have loyal readers with whom they connect. I’d like to work on doing a bit more of this sort of thing, for instance in Fall 2014 Gail Anderson-Dargatz has her first Rapid Reads coming out, the first in a series featuring journalist and sleuth Claire Abbott. Gail will be doing a series of library appearances in BC. It will be good to see what the libraries think of them and go forward with that information. 10) Have book reviewers looked at the books being published under the Rapid-Reads banner? If yes, have the reviews been favorable? “Ever start a book and then put it down for so long that when you pick it up again, you have to reread the beginning? Ever take a book out of the library and discover it’s due back before you’ve flipped it open? I’m guilty on both counts. I’ve read gorgeous books in fits and starts, all the while knowing that I’m missing out – that the book is not getting the attention it deserves, that its beauty is betrayed by the cracking of its cadence.